Examine any recent mainstream media story about Mark Brand in the Downtown Eastside, and you'll find some version of the same myth-hype. (The word here is hype, but it could have been type.) Almost-still-a-boy with heart-of-gold overcomes outsized obstacles while building an entrepreneurial empire whose main purpose is to help the local poor. The problem is, when the separate stories are looked at together, they do not add up. But in the world of business — the world that is always presented as Brand's theater of action — the bottom line demands that everything does add up. The title of the latest episode sounds good on the spinning surface: Gastown Restauranteur Cooks Up a Deal . Do nothing more than eyeball that headline, and you may think that go-to-guy Brand is making even more things happen. Brokering a deal, the article says. But wait. Can you really connect all the bits of the narrative and still see Brand as exercising any agency other than reactive desperation and attempted salvage? Start off with Brand's personal debt "to the tune of about $1-million" and his simultaneous juggling of nine businesses . Then go back to earlier news about how the four floors of Save-on-Meats were destined to become "the headquarters for his budding empire" . The "million-dollar facelift" of what "sounded like a pipe dream" resulted in a ground-floor of "airy space" with lots of elbow room — complete with commissioned artwork, custom steel for the counter, handworked brick restoration, etc. "The attention to detail was costly" . Toss in a biofuel diesel engine and three rooftop hothouses heated by repurposed energy, items designed to cast a greenish hue over the megaproject . According to the older news, Brand controlled the 22,000 square feet  of the entire building on a 20-year lease . Now he hangs onto the ground floor only (out of the four floors), still pays one-third of the rent, and is tied to "a five-year locked-in agreement." The conditions are that "he'll reduce his kitchen operation to the ground floor only, where he'll reduce the butcher shop and increase the diner and kitchen" . Notice that the word reduce pops up twice in the same sentence. According to the press release of the acquisitor: "Anthem has plans to renovate the building, and will consolidate the Save on Meats businesses onto the ground floor retail level" . The future for the one Save-on-Meats floor that remains to Brand sounds far less airy and spacious than it used to. 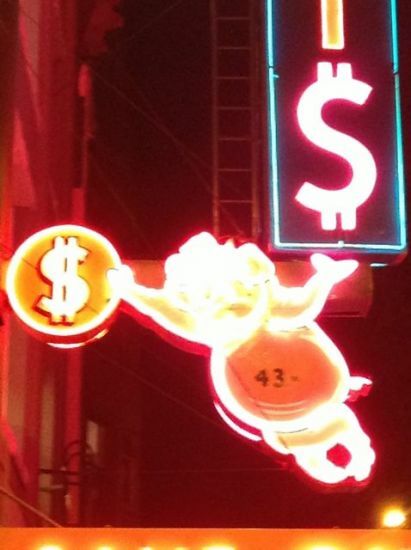 On 13 March 2013 Anthem Properties Group Ltd. announced its acquisition of Save-on-Meats at 43 West Hastings Street in Vancouver. The press release  says that the acquisition was completed on 28 February 2013. The new owner anticipates using the bulk of the building to "create new, loft style, office space" which it anticipates providing for occupancy "as early as August 2013." The Vice President of Investments and Communications says Anthem is pleased to add another building to its downtown eastside portfolio which includes recent purchases: 190 Alexander Street and 425 Carrall Street (the former BC Electric Building). In the past, Anthem has also been involved with the development of 611 Alexander Street. The Anthem web site  lists around 125 current and past holdings and projects. Save-on-Meats is listed as two separate projects — "shopping centres" and "office." It seems clear that Anthem views Vancouver's Downtown Eastside as an ongoing profit opportunity. In 2009 the Vancouver Sun ran touching coverage  of the 78-year-old former owner of Save-on-Meats. Al DesLauriers had put his building up for sale at $3 million and was hanging on to hopes that a way could be found to have the familiar core business live on. Eventually the building was bought by Steven Lippman, after DesLauriers rejected other bidders who would not commit to "continuing the street-level operation" . The selling price has been reported as $2.36 million , which suggests that the wishes of DesLauriers led him to forego hundreds of thousands of dollars. By late 2010, a "new future" was said to be in the works, with Mark Brand standing at the forefront . One key to the complicated deal was a hand-over of $35,000, dredged up from one of Vision Vancouver's little City-of-Vancouver stashes . Aside: The use of a neighbourhood house to execute top-down policy while pretending to have a local area base is a nasty new administrative trend to keep a sharp eye on. Another piece of the wheeling and dealing was a package of $665,000. VanCity and Building Opportunities with Business were two of the major participants in that creative bout of financing . By mid-2011, feel-good hype about "a million-dollar facelift and a whole new vision" plastered thick goo all over the front page of the Vancouver Sun business section . Meanwhile Mark Brand is quoted as insisting "he doesn't want to gentrify the city's poorest neighbourhood; he wants to work with residents to improve it." Even though he is taking "a big gamble in what is still a very edgy location." As the Vancouver Sun promo piece tails off, Brand stands "passionate about helping to revive the historic strip." A check-in story in early 2012 finds Brand "juggling cash, trying to figure out which funds we can drain" . But in the background, four months of filming for a reality TV series casts an aura of glamor over his epic entrepreneurial struggle. In one refreshing bit of honesty, Brand admits that an element of his "affection for the Downtown Eastside" traces to "the business perspective of cheap rent." As of late 2012, the Globe and Mail purveys unwitting irony with its title for a piece that follows Mark Brand around as it attempts to gauge "the quickening pulse of an area in transition": Downtown Eastside is Open for Business . Francis Regio of Cork & Fin restaurant on Carrall remarks that "a range of retailers have lured shoppers from across Vancouver by offering everything from designer clothing to $3 doughnuts" . This is what revitalization for the Downtown Eastside is supposed to look like? Without further research, it can be seen that Save-on-Meats went on the market in 2009 at $3 million, and was then acquired at $2.36 million, seemingly with an understanding that the meat business would continue. To know the acquisition price paid by Anthem would be interesting. It would also be interesting to know the extent to which the apparent $640,000 good-will discount is in the process of evaporating — if not already, perhaps within the coming five years? Factor in the $35,000 gift from the City of Vancouver and the "package" of $665,000 and then wonder what those funds have come to. Don't forget the unintentionally humorous façade grant mentioned in passing by the City of Vancouver report . When you try to follow the money in Vancouver, you are forced to grasp at inklings. Nobody's talking now about how the purported 80 employees  are going to squeeze onto the main floor of the building while making room for the increased diner space. No talk either about the efficiencies of renovating the expensive new renovation. VanCity has gone over the top in exploiting the Mark Brand story to plug its own social relevance. VanCity customers are routinely force-fed video propaganda that plays in the background as they stand in line at the branches. There's also a promo spot on the web site , and a one-pager that has been laminated and laid out in customer's faces at teller windows . It's a real question whether the "Resilient Capital" partnership with the Vancouver Foundation is panning out in this case. But that program is still showcasing Save-on-Meats as an example of "organizations with proven business models" . Mark Brand has been widely touted as heroic rescuer of an historic Vancouver retail icon — and a caring saviour of local social enterprise to boot. Considering the business transaction that has just taken place, it could be that Brand will discover that he unwittingly signed up to star in a diversionary melodrama. The best actors embed their roles in their brains and try to live them out from the heart. Meanwhile the studio bosses focus on the take and treat their stars like meat. The Vancouver gentrification machine has swarmed all over this narrative, a fairy tale that might help diffuse that harsh and sudden shift from stalwart old-school community-friendly business to maximized naked opportunity for investment profiteering. Hypocrite politicians toss a few nickels and dimes at a problem that they hope will somehow go away. A community credit union scrapes up a few spare quarters. Then the big boys with the real money swoop in to make their killing, but only after a good deal has already been set up for them, complete with public relations wrapper. Where will Anthem strike next in the Downtown Eastside? Just wanted to give you props for delivering facts. I'm wondering if you'll be doing a piece on the gongshow also known as the Waldorf Productions now Arrival who have joined up with another DTES "hero" David Duprey. There has been a lot of misinformation regarding the closure of the Waldorf and their failings as business people. As soon as I read about Anthem's acquistion of Save-on-Meats, I felt seized. Like I could see the story in one blinding flash. Some of the grist was sedimented in memory. Getting back to the earlier material that I thought existed panned out. The piece took an insane amount of time. I could get seized by Waldorf, but that doesn't seem likely. (1) I lack the sediment, which already says something. (2) I'd be surprised if the mainstream journalistic record holds as much meaty detail. (3) Arts-as-enterprise fundamentally gives me the willies. (4) When power and privilege spew around trendy crisis, I want to be somewhere else – and I was. If someone else makes the Waldorf thing critically comprehensible, let me know. I'd go out of my way to read the piece.